The mission of Taktse International School is to develop a diverse community of self-motivated students and teachers who have a passion for excellence, inquiry and life long learning. The curriculum will prepare students for the challenges of a competitive global economy while the school culture will nurture self-confidence, social responsibility, and environmental awareness. At Taktse International School [TIS] students will learn how to learn, how to create and how to balance the increasingly complex outer world with the inner one. Our students will be independent and innovative thinkers, confident, articulate communicators and, above all, they will be compassionate and ethical leaders. We are committed to creating an atmosphere where cultural heritage is known and valued, where the environment is honored, and where teachers respect that each student has a vast and unique potential. TIS is committed to cultivating a community with the core values of honesty, respect, compassion, purposefulness, professionalism, courage and humor. It will be a community where children respect and revel in each other’s dreams and the hard work it will take to reach them. TIS will confront gender inequity and offer equal opportunities to all students regardless of gender, race, religion or economic status. To this end, TIS will actively and continually pursue scholarship opportunities for its students. The TIS curriculum will be holistic, inter-disciplinary and rigorous. Our graduates will be fluent in English and at least two other languages. They will be financially astute, debate the nature of the mind, compose music, build a website, rappel down a cliff, understand Nagarjuna and make momos. 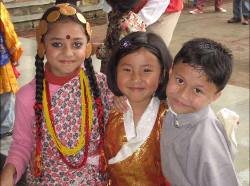 In preparation, our younger students will sing songs in three languages, finger paint, read Jataka tales, create simple computer programs, meditate, plant trees, put on plays and eat momos. Located nine kilometers north of Sikkim’s capital, Gangtok, TIS is surrounded by lush vegetation and abundant wildlife at an elevation of 6,000 feet. It has panoramic views of the rugged mountains and valleys. To the west is Mt. Kanchendzonga, to the north the “Om Chu” (Milky Water), to the east lies “Smriti Van” [Sacred Grove] and to the south, the campus backs up onto a hill that rises some 300 feet, with ancient meditation cottages perched atop. Takste International School will be the premier school of Sikkim and a model for global schools. Unlike most private schools in developing countries, TIS will be a non-profit school. Monies will continually be re-invested back into the school. We will be a constantly self-improving institution, striving always to prepare our students for a fast-changing world. This is a big dream. Many would describe as impossible. We do not agree. It is a challenge, a crucial investment in our future generations and in our land. It requires the participation of generous visionaries who believe in a greater good. If you would like to help support the goals of the Taktse International School, please donate here.